With this month my blog has reached its sixth anniversary. That the previous year was eventful for me would be an gross understatement. 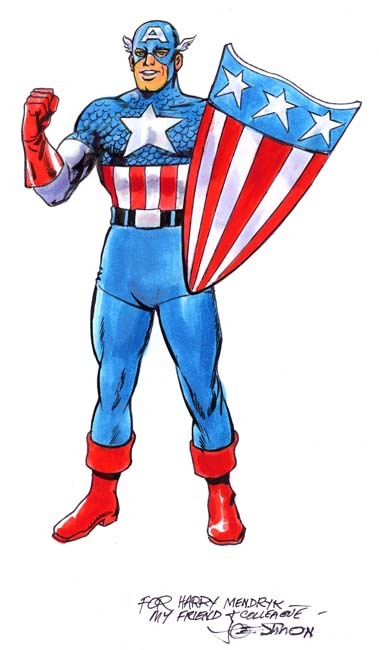 The release of Joe Simon’s autobiography and the Captain America movie were key events. 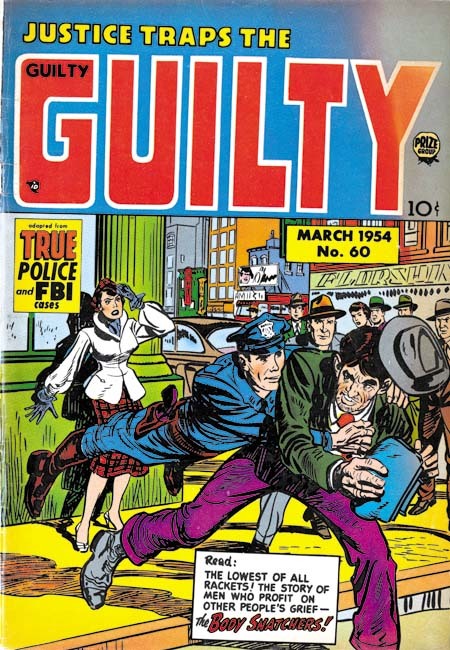 But on a more personal note was the publication of Titan’s “Simon and Kirby Library: Crime”. Joe and Jack’s work in that genre are among my favorites. 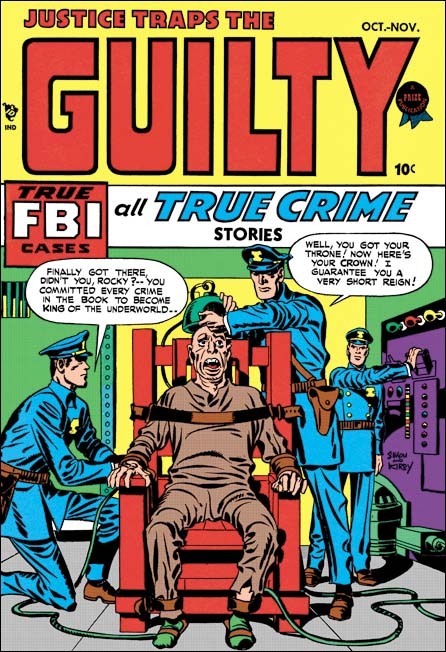 While I have hopes that a second volume of Simon and Kirby crime might eventually see print it appears that my dream of working on my other favorite Simon and Kirby genre will not be fulfilled. Of course the most significant event of the past year was the passing of my friend, Joe Simon. Joe played a large roll in my life of the past decade or so and I miss him greatly. I realize that events arising from Joe’s passing has had a negative impact on my posting on this blog but I hope that has begun to change. There is so much more that I want to write about Simon and Kirby. But who needs words when we have Jack Kirby to provide an illustration. Off course even Kirby found it difficult to translate four dimensions into just two. The task might be theoretically impossible but the scene that Jack provides is clearly unlike any the reader has ever seen. In the next panel anything remotely naturalistic is replaced with abstract colors. 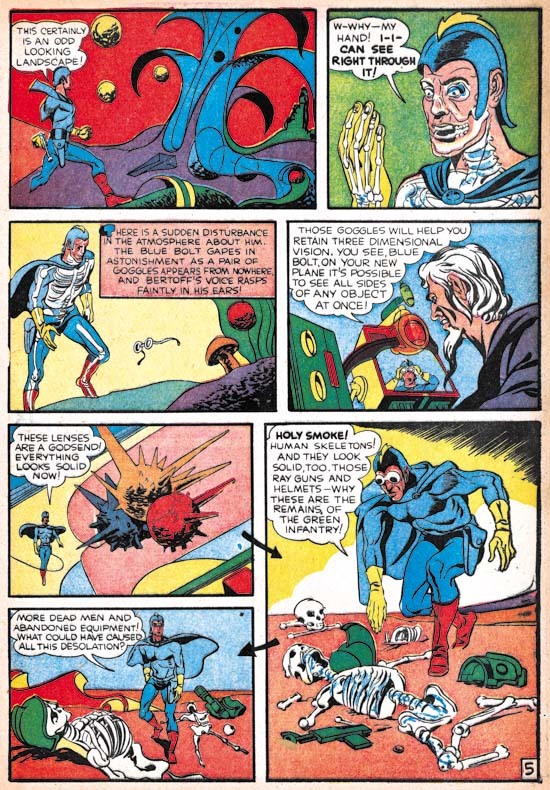 As “otherworldly” as the images from page 13, on the next page Kirby presents ultimate in non-reality. Here on the figure of Mr. Fantastic is drawn while the rest is a collage. 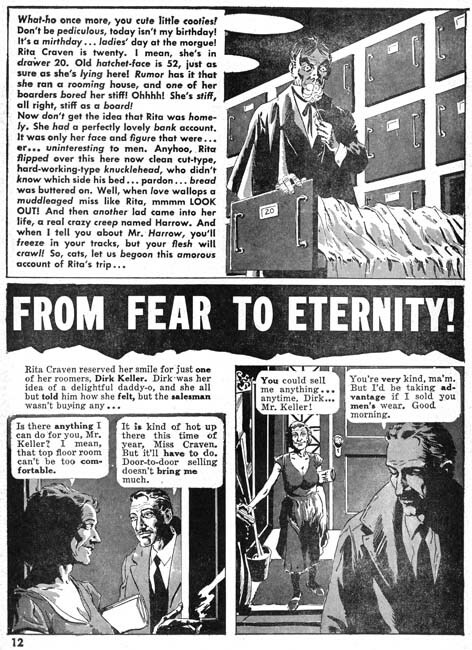 Kirby was not the first to use photographs from magazines and newspapers in a comic book. However previous uses were rather mundane shortcuts to creating an image and nothing like the innovative collages that Kirby created. The image Jack constructed for page 14 is particularly effective. Photographs gain an acceptance as “truth” that a drawing does not provide. Sure our logical minds know that photographs really are not necessarily true, particularly today with software like Photoshop. However our emotional reaction still accepts photographs as depicting truth. Kirby plays off the photographic “truth” against an scenery that is obviously unreal. That tension is something that a drawing could never quite create. 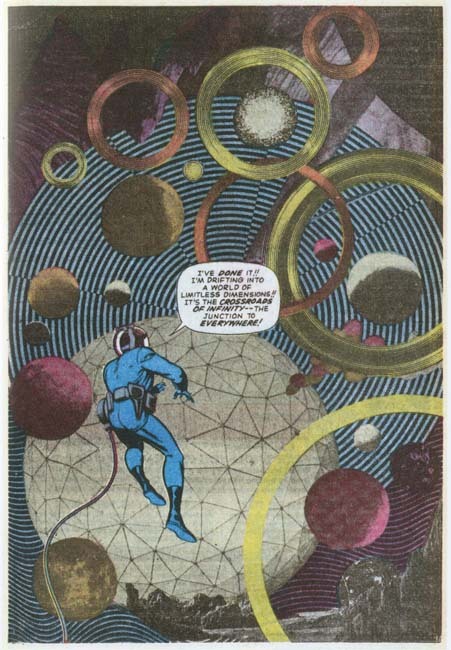 Mr. Fantastic’s visit to the Negative Zone was not Kirby’s first depiction of the Fourth Dimension, not by a long shot. 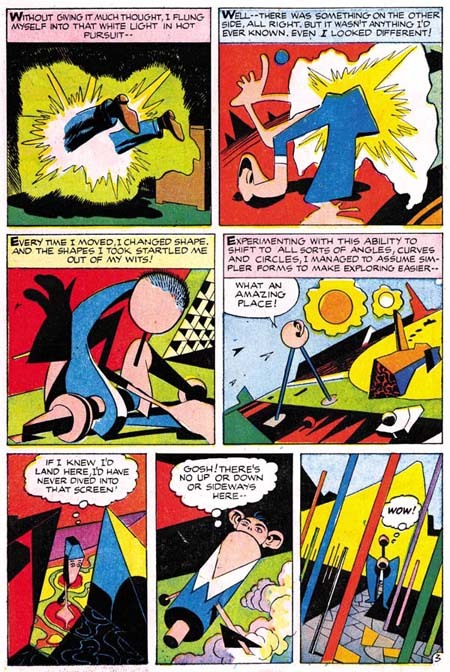 His earliest occurred in collaboration with Joe Simon in Blue Bolt #5 (October 1940). Blue Bolt enters the Fourth Dimension through a cylinder surrounded by the earliest example of Kirby Krackle (Evolution of Kirby Krackle). 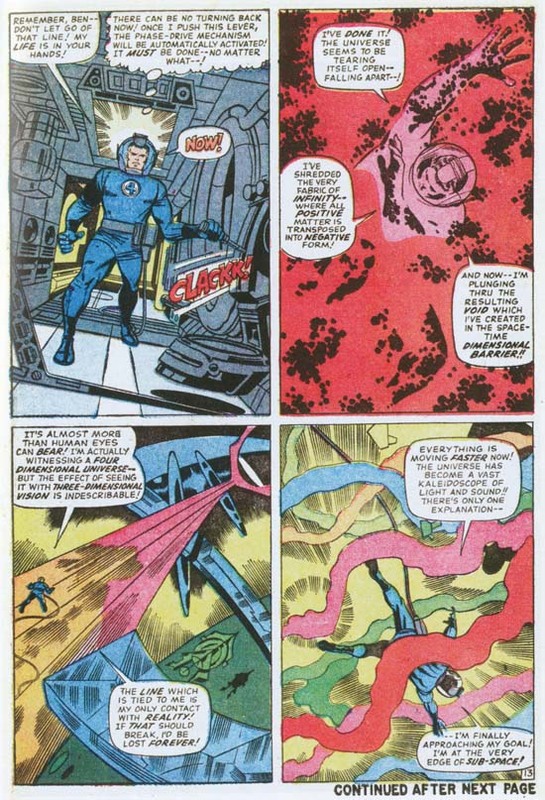 On entry the hero is presented with an “odd looking landscape” reminiscent of the effect found in Fantastic Four #51. Blue Bolt then finds he can see through objects and requires special goggles to see in three dimensions. Kirby would return to the Fourth Dimension theme in an appropriately titled story “The Fourth Dimension is a Many Splattered Thing”. 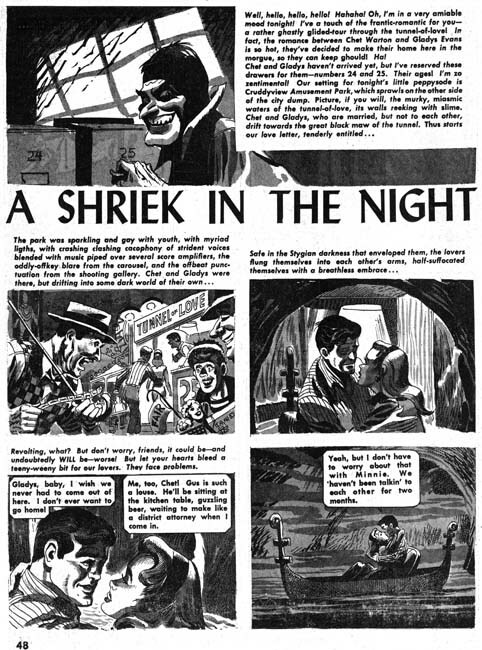 This work was done in collaboration with Joe Simon but after the breakup of their studio. 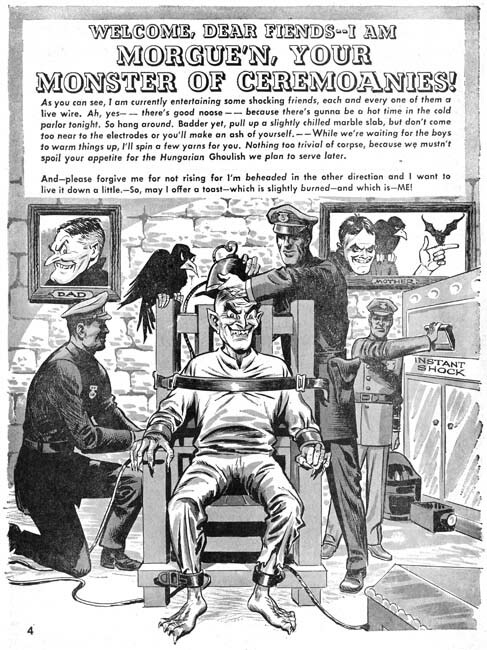 Here Jack’s attempt to draw the indescribable result in some of the most unique images from his career. 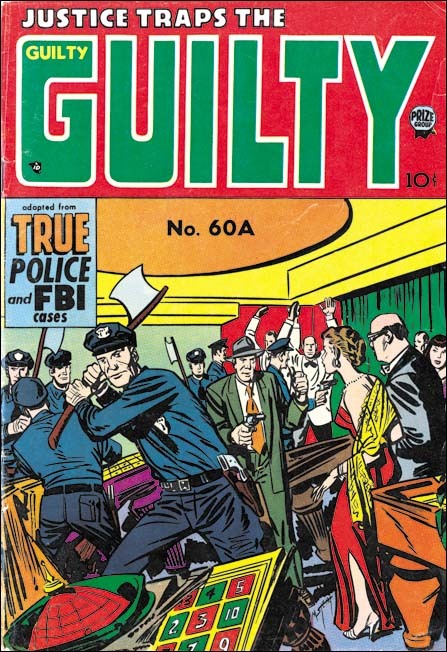 Kirby had a long career as a comic book artist. It is surprising how certain themes show up repeated at different points in his career. The Fourth Dimension and Kirby Krackle are just two examples of this phenomenon. If it was just one or two incidences like this it would be easy to write it off as of not great significance. But actually there are many more examples that can be found (and I am sure I will post others from time to time). This signifies to me that Kirby was much more than an illustrator to the stories that he worked on. This is not to denigrate individuals like Joe Simon or Stan Lee for their contributions were also important. Posted March 18, 2012 in 2012/03, Odds & Ends. 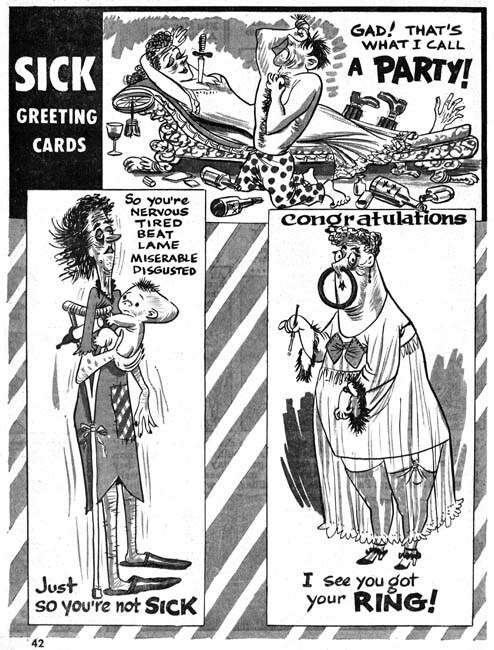 Fan letters did not play a part in Simon and Kirby productions. That is not to say that fans did not write letters just that Simon and Kirby comic books did not include a letters section. 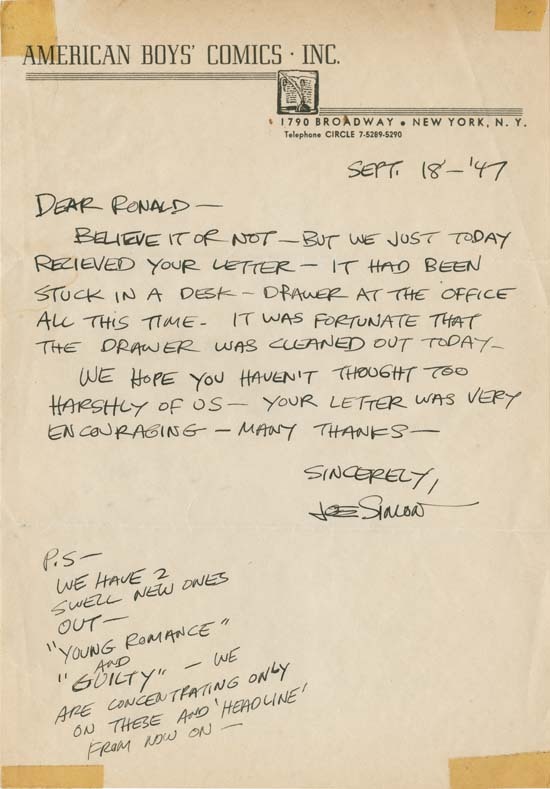 I have never seen a fan letter to Simon and Kirby but obviously there were some because there does exist a letter that Joe wrote in response to one fan, Ronald. This letter was issued at a critical time. 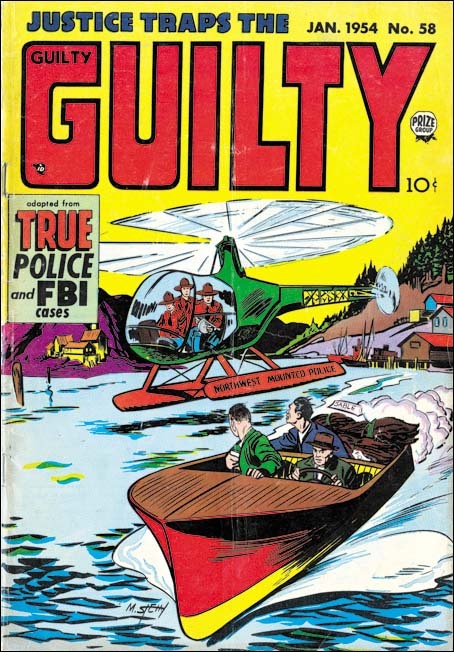 After the failure of Simon and Kirby’s work for Harvey (Stuntman and Boy Explorers Comics), Joe and Jack were forced to find whatever work they could. 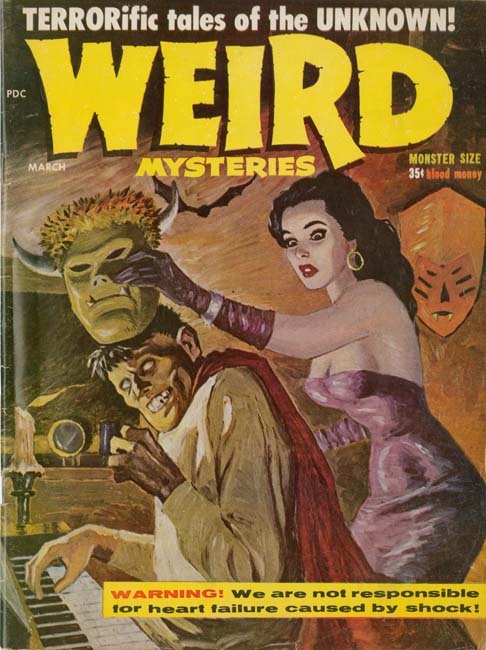 They ended up simultaneously working for two companies; Hillman (Clue, Real Clue, as well as some other titles) and Prize (Headline). This letter was written at the time that they stopped working for Hillman in order to devote themselves to Prize. 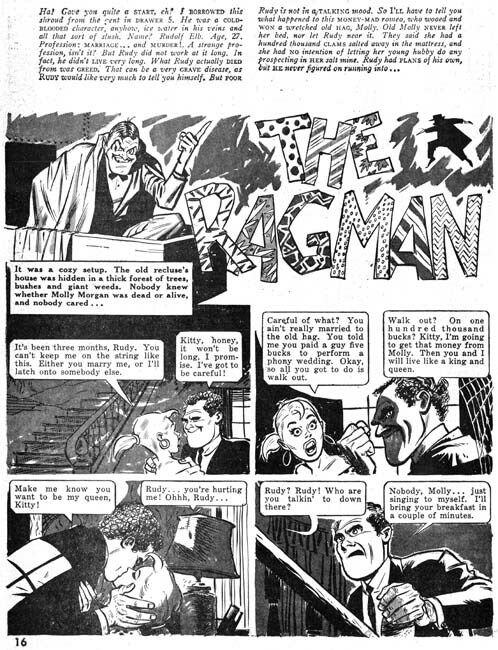 Apparently the original fan letter was misplaced and only recovered Simon and Kirby were vacating Hillman. 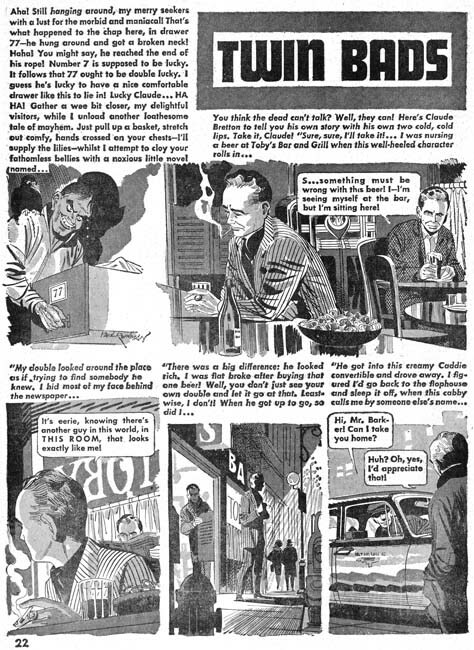 American Boys’ Comics Inc. was one of the names used by Prize Comics; Crestwood Publications and Feature Publications were two others. 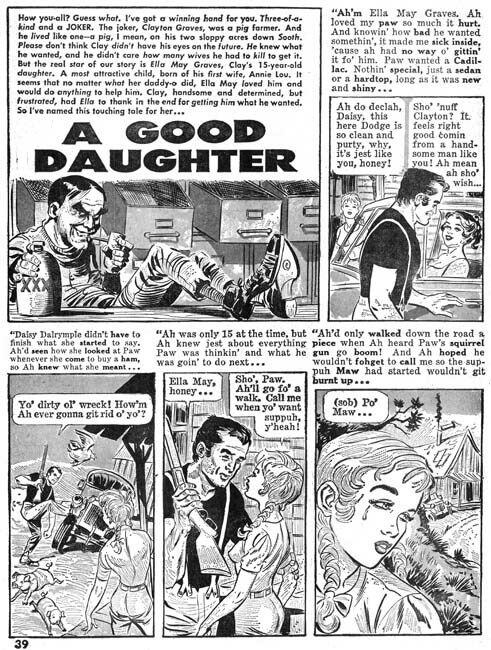 The name American Boys’ Comics was used mostly during mid-forties but its use seems to have been discontinued not too long after Joe’s letter. However there was no change of address to accompany the name change. Ronald must have been very pleased to receive this reply to his fan letter from Joe as he kept very good care of it. The paper has yellowed but the preservation is otherwise very good except for the remains of tape on the four corners. Ronald probably had taped into a scrapbook. Posted March 10, 2012 in 2012/03, Artists, Odds & Ends, Simon, Joe. Helping the Simon family has put my work on the next Titan addition to the Simon and Kirby library behind schedule. When there just does not seem enough time life seems to have a way of just making matters even more difficult. Most of my writing for this blog is done during my lunch hour at work but recently I have had to put extra time on my job as well. I hope things will settle down to a more reasonable pace in the near future which will allow me to return to my more regular posting. In the mean time above is a video of Joe Simon taken by Desert Wind Comics. Joe did signings for Desert Winds. I believe this video was made about a year before his passing.